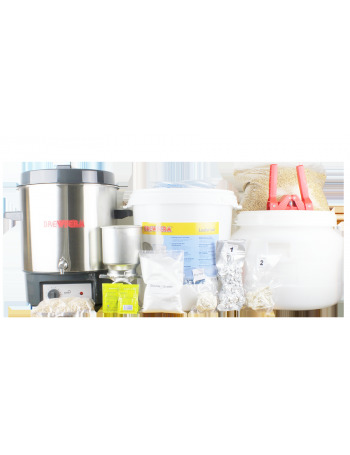 This Brewferm Superior electric home brewing kit is designed for amateur brewers looking take their next step in the world of home brewing using quality equipment. For your ingredients (not included), choose from Brewferm malt extract kits or make your own selection of malt and hops. -27L electric stainless steel brew kettle with thermostat and tap. - 30L fermentation bin with airlock and tap. - Chemipro® OXI cleaning product. - Crown capper 100 crown caps. - Book: ‘Brewing beer for beginners’. So, you want to brew your own beer using all-grain but you’re not sure where to start or what recipe to use? BREWFERM’s ready to use kits are the perfect solution. These malt kits contain all the ingredients needed to brew 15-20 litres of beer from scratch, including the malts, special grain (soft wheat, maize, etc. ), hops, in some cases herbs, and dried yeast. They have been developed by master brewers according to tried-and-tested recipes and packaged to offer optimum freshness. Comes with detailed instructions and diagrams.